We crossed the Zoji La at 11,575 feet; headed towards Leh and crossed Drass & Kargil. We saw the landscapes of Kashmir and Ladakh changing from green to golden sand and then back to green. Kargil and Drass remind us all of the war we fought to save our motherland and were victorious. The Indian hills were captured by Pakistan army at Drass and Kargil, taking a U turn on a peaceful agreement, and were further in plans to extend their arms to the whole of Ladakh. Our soldiers of Indian army and air force fought continuously for 60 days and many of them sacrificed their lives to sway the Indian flag back there. So, crossing the valley without paying a tribute to these national heroes at Kargil War Memorial, Drass will be a real injustice. It was around 1:00 pm; a warm day than usual, we were talking, and driving towards Kargil from Drass city thinking to spot the Tiger Hill, Tololing, and the Kargil War Memorial on the way. 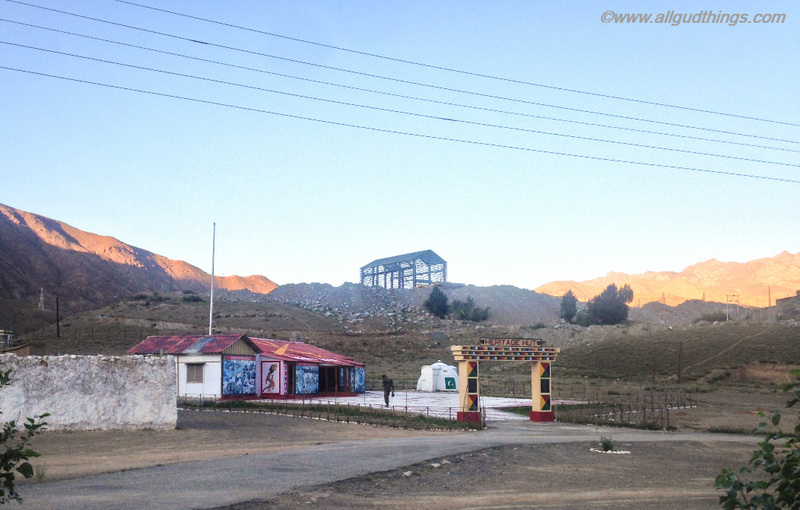 Just 5 Km ahead from the city, pink walls surrounding the building appeared and it was the Kargil War Memorial. We stepped out of the car and entered our details in the register. A tall, well build, dark complexioned, sun kissed, perfectly suited Indian army soldier grinned and welcomed us at the Kargil War memorial gate. 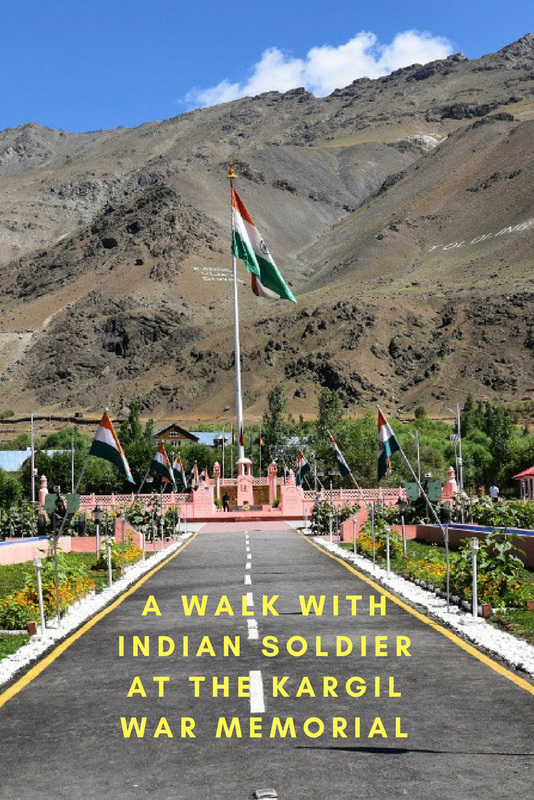 We walked with him through the pathway (Vijaypath) laden with tri colors to another tall fluttering Indian flag with the Tololing hill as a backdrop. The loud echoing voice in pride started explaining to us that O P here is Operation Vijay and its rear wall has the names of Martyrs inscribed in gold. While listening to the whole blood shed story of operation Vijay we realized that our smiles were already taken over by solemn. We were already sunken and eyes were struck, thinking how our brave Indian soldiers might have climbed this rugged scalloped Totoling Mountain, and the majestic Tiger Peak with artillery on their back during Kargil War. In the meanwhile, he broke our silence at Kargil War Memorial and directed us towards the Amar Jawan Jyoti, the eternal lit flame as an homage to the soldiers who lost their lives in the Kargil war. There were some interesting lines in Hindi written on the plinth which he continued explaining. In simple words it meant – A flower says that it doesn’t want to be a part of women’s jewelry or wants to impress anyone, rather throw it on the path where young men have laid their lives for this country (India). Veer Bhumi houses the memorial stones of martyrs with their names and rankings. 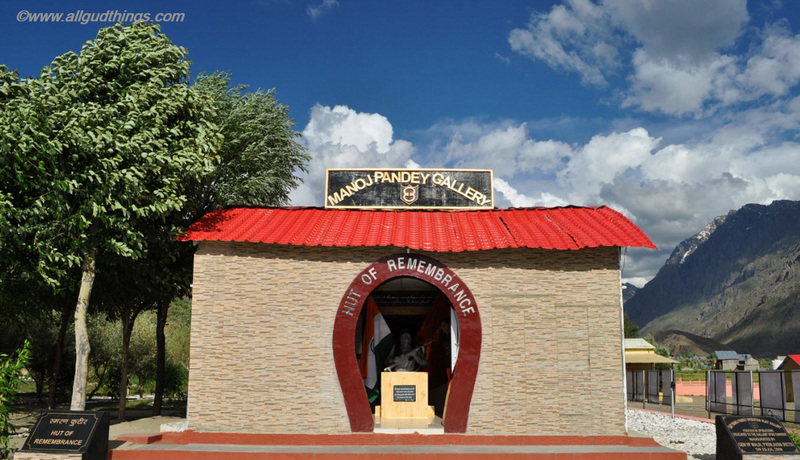 From here we moved to the Manoj Pandey gallery at Kargil War Memorial; also known as the Hall of Remembrance which houses the pictures of martyrs and the used artillery during Kargil War. At the entrance, it had a Shradanjali Kalash gifted by an NGO in the memory of soldiers who lost their lives during operation Vijay. On the other side, he showed us the Vijayant Helipad, named after the captain Vijayant Thapar who lost his life during the Kargil war. 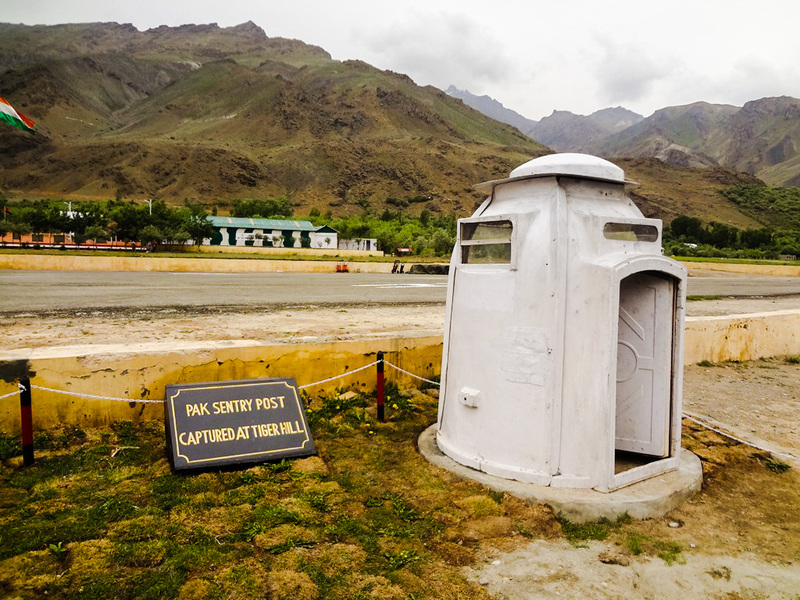 And the captured sentry post and the living bunker of Pakistan during Kargil War.The bunker looked quite small from outside but it was quite spacious inside and 3 persons can easily stay in it. It was quite an amazing hour where we could actually see the life of Indian soldier but we wanted to understand and talk to another soldier to know more. 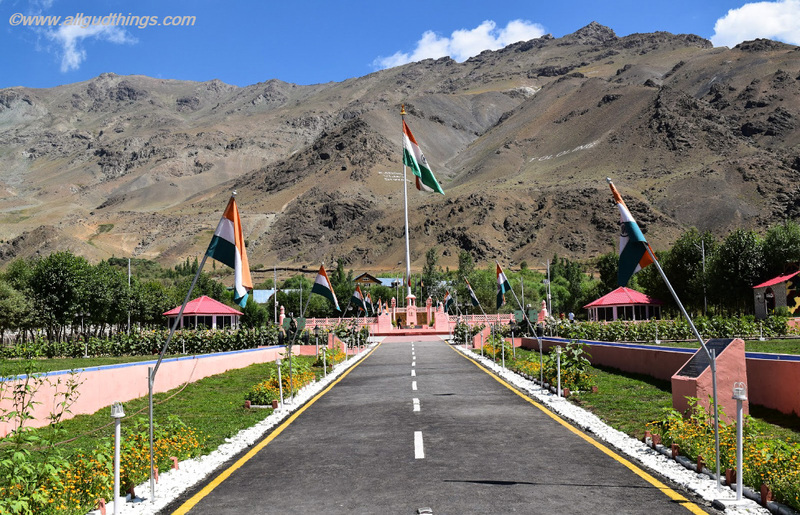 So, we thought to visit another war memorial, helipad and heritage hut at Kargil, on the way to our Leh Ladakh road trip. After showing ID cards and making an entry in register he started walking with us. Suddenly, he pointed towards the tall peaks in front, asking us to make out which one is India and Pakistan. We looked at each other, then at him and started questioning, what – are we that close, is someone really watching us from there, have you ever been up there, and so much more like these. Ques: Can we really see Pakistan from here? Ans: Yes! That is the peak captured by us and the left one you see there is PoK (Pakistan). Ques: Is someone always guiding those peaks? Ans: Yes! Be it winters or summers, someone is always there. If they took the charge of the peak which is at Kargil backdrop, they can target the whole area easily. Ques: How long have you been here and how is life here? Ans: It is just 2 years. Life is really tough but I always wanted to be in the army and the dream has come true. We are living for our nation. India is my mother and I will fight for it. (There was a deep passion and pride when he was speaking these words and my gaze was fixed on his expressions). Ques: Have you ever been on that peak? Ans: Yes! I was there in the winters for 6 months. I just came back at the base this week as I have to go for a holiday to my village. Ques: In winters, the whole peak might be covered with snow, so how you manage to survive? Ques: Are Bunkers comfortable and how do you manage your food? Ans: Bunkers from inside are really cozy and we have enough stocks for the next six months. Ques: From where do you get access to water in winters? Ans: We collect and melt the snow to drink it and it really takes hours to get melted. Ques: Is there any provision for electricity there? Ans: No, we cook and do our other activities during day time only. We have solar panels for emergency light and recharging our phones. In winters there is no sunlight for days, so we are totally cut off from everyone. Ques: What do you do while being there at the peak? Ans: We have six hours of shift duty and we continuously monitor the activities and movement of the enemy. Ques: How far is Pakistan’s bunker from India’s? Ans: It is hardly any distance. We talk to each other shouting and quoting “Bhai” (brother) and sometimes even ask what did you had for lunch. Ques: Are you afraid that anything can happen at any time and you can lose your life? Ans: Not only we; but our families are also prepared. We are living for our country. If anything happens we will not die but will get SHAHEED (martyr). Ques: Do you miss your family? Ans: Yes! A lot but we don’t mention anything to them. Otherwise, they will cry and will be in pain. Ques: Do you celebrate festivals? Ans: When we are at peak, we don’t have any idea about the days, months and dates. But if we have a phone connection, then we get to know. Ques: Is there any risk at the Kargil base? Ans: Yes! This is a complete war zone, anything can happen anytime. We have to be always prepared. Ques: How do you carry your luggage and weapons to the peak? Ques: Will you be going back to the peak top again after coming back from holiday? Ans: Yes I will! but our chiefs only take the final decision. The questioning didn’t end here but he took us to the heritage hut to show the pictures of real heroes who sacrificed their lives for the nation and the artillery used during that time. The heritage hut too had pictures of tribes and samples of the traditional stuff of Ladakh. From here, we moved to pay homage at the memorial and see helipad. The heritage hut too had pictures of tribes and samples of the traditional stuff of Ladakh. From here, we moved to pay homage at the memorial and see helipad. That was all we learned about the Indian army soldiers and operation from the two brave gentlemen but since that day our heart and brain are on the run. We can feel the big heart those mothers and wives have those who send their children and husbands on the border. In the end, it was just a memorable day. We can just say heartfelt thanks; to our brave Indian soldiers, who fight all the odds and hardships to secure us day in and out and even gave up their lives to save us and our country. And it is just because of them today we got the chance to do Leh Ladakh road trip, peacefully. Note: Every year on 26th July, Kargil Vijay Diwas or Kargil Diwas is celebrated as on this day conflict officially came to an end and Indian army announced complete eviction of Pakistani intruders. A big salute to our Indian Army!! 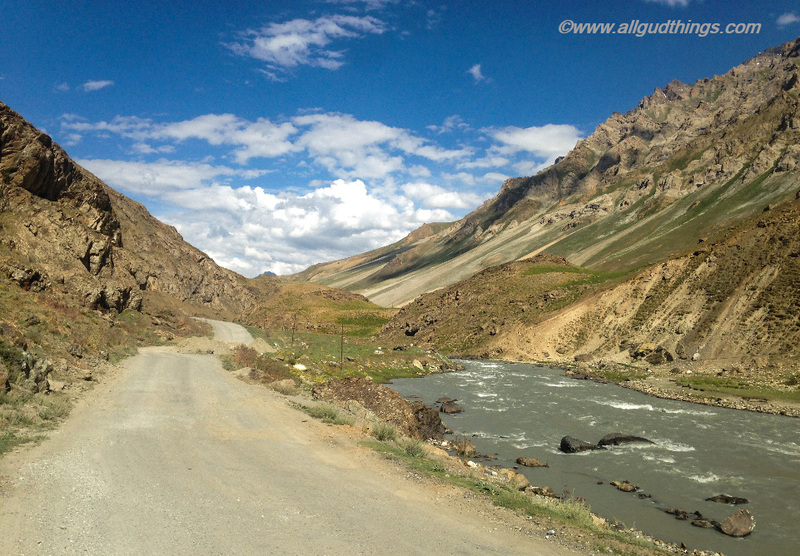 You can also check the complete itinerary for Leh Ladakh road trip and other series of the valley. The Kargil war memorial never fails to touch me to the core as it must every Indian. This hallowed place where so many of our brave soldiers fought valiantly and laid down their lives must bring a tear to everyone’s eyes. It must have been a really special experience as you walked towards the memorial. Hope to experience those moments some day. Beautiful post.. Eagerly waiting to go there. Oh wow, such scenic routes!! And I love the thought that some people are watching you from afar or from Pakistan, at that. I wonder what beauty they can see from their perspective! “…for your tomorrow, we gave our today”. Wow, so profound. I actually got teary eyed. Memorials and sites such as the one you visited always make me emotional. War is such a terrible thing but it’s always good to visit and reflect. Thank you for sharing! This place brought tears to my eyes . I had this huge lump in my throat as I walked those memorials and heard stories of the epic battle. In fact the entire troop that I was with felt the same. 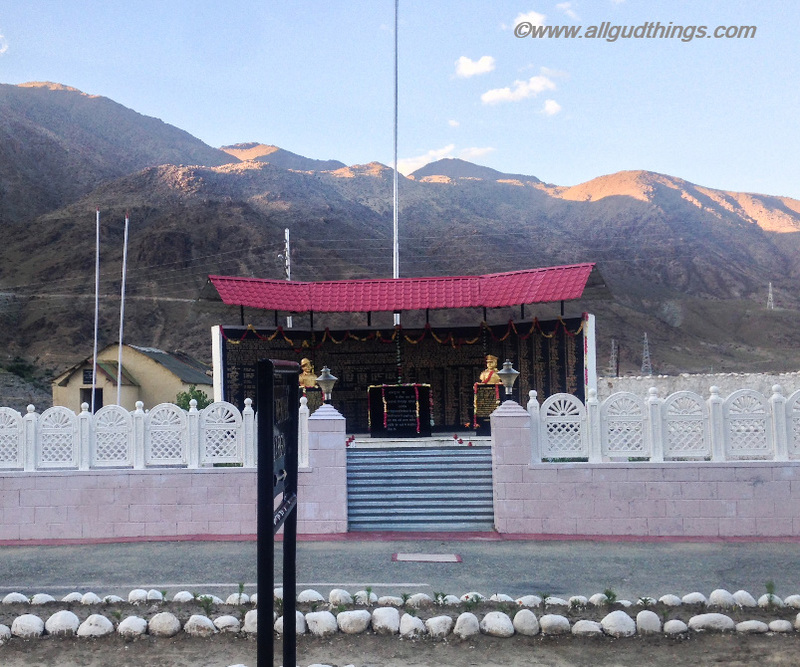 Kargil war memorial will always be a special part of my visit to Ladakh. My husband would love this kind of trip, and even the more so, to be able to talk to a soldier who has been making history. We always stop at memorials whenever we’re on the road. In the States there are many, but I didn’t know of this one in India. Thank you very much for this beautiful story! Thank you for sharing this post. It really shows how close beauty and horror can be. War only knows looser and i wish there wouldn’t be any wars anymore at all! What a stunning setting for a memorial. I think it’s so important to visit these sites. Oh! What a tour! Thanks tour pics I got an idea of how the memorials there are like. What a blunder on our part that the Pakistanis could encroach into so much of our territory. The forces there need to be more vigilant. Sometimes I wish I could join duty there. I had no idea about the Kargil area. Great pictures and interview. Loved your interview with the soldier who was stationed on the peak for 6 months. To think that such a beautiful area in the world was once a major war zone and is still considered a potential hot spot. 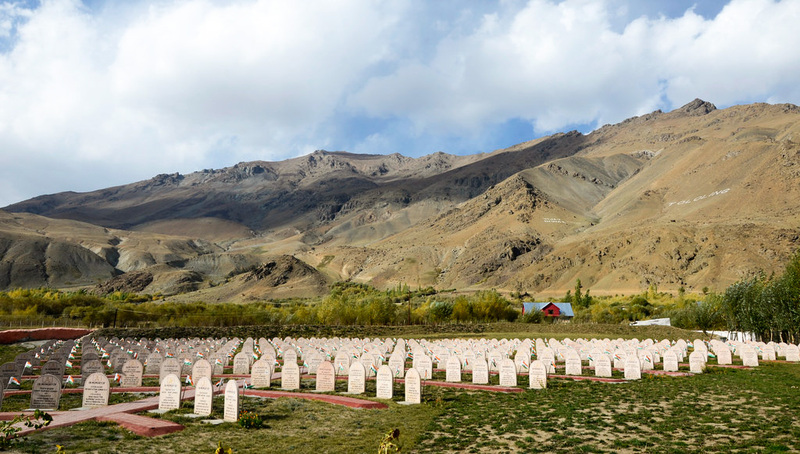 The Kargil War Memorial is tragically beautiful. thank you for sharing this post. Interesting interview with the soldier. Speaking to some one who sees death daily in his face and stays strong for his country and fellow citizens is commendable. War is evil I pray the human race would understand that and live in peace. You did an amazing job documenting your adventure and interview! You really highlighted it and sparked my interest! The kargil war memorial brings back a lot of nostalgia. And also pride for our soldiers that we feel. It’s so great that you took out time during your trip to visit here as well as dedicate a writeup to it. The stories like that of Kargil are something everyone should know. The Kargil War Memorial is truly beautiful. who would have thought that this has turned to be a beautiful tourist spot . I love how you were able to tour us around. I wouldn’t get tired of ambling around as well If I get the chance to traipse my feet here. The views are spectacular and stunning. I should really make sure that my Cam battery is full so I could take a lot of photos of the place. This article filled my heart with patriotism and tears hearing the story and situations are soldiers are facing. Hats off to them for their sacrifices and courage. Thanks for sharing!! Beautifully written! Your post reminded me of 2012 when we were there :)…. Nice pics btw! Kashmi, Leh & Ladakh are some of the places that I’d love to go to in India, one day. Having said that, this is my first time reading about Kargil and the war. It’s ironic (for lack of a better word that comes to my mind now) learning how a place with so beautiful landscapes like this had seen bloodbaths. The soldiers really had given their day for a better today. I’ll be sure to stop by here when I’m doing my Leh & Ladakh trip. Amazing photography and a touching story that we probably never would have heard if you hadn’t told it. Thank you! It’s really interesting to learn about the war history of nations which aren’t our own – obviously what we’re taught in school about history is very localized depending on the country you’re from – so being from Australia, I don’t know much about the war between India and Pakistan. But what a moving visit to pay tribute to the brave soldiers who defended your country – Veer Bhumi in particular looks very moving, set among the backdrop of the valleys and mountains and offering a direct insight into the difficult terrain they would have had to fight across. I think for those of us who aren’t nationals, these war memorials are still a great place to visit, as it offers an insight into the history of the country, and allows you to speak to locals, as you did with the soldier you met. A very memorable day. Thankyou for sharing. Loved the interview with the solider that is such a great idea. I love when people have pride for there countries. Loved the interview with the solider that is such a great idea. I love when people have pride for there countries. It is so heart warming. Gorgeous pictures. Amazing story. I’d love to visit that part of the world. The history is so interesting. A short talk with full information in between. War is such a terrible thing but it’s always good to visit and reflect. How lovely is the passion of that soldier. What a heart-touching interview! No one can imagine how tough is the soldier’s life, putting one’s life at stake in order to protect their nation! Hats off to all these brave men and their families! Such a beautiful place..It’s always a pleasure to take a walk in a soldier’s grave with a soldier by side.Such a Great interview,and knowledge about history..Soldiers are our heroes as well. Very interesting and informative article. I am sorry to say I was not familiar with this conflict. 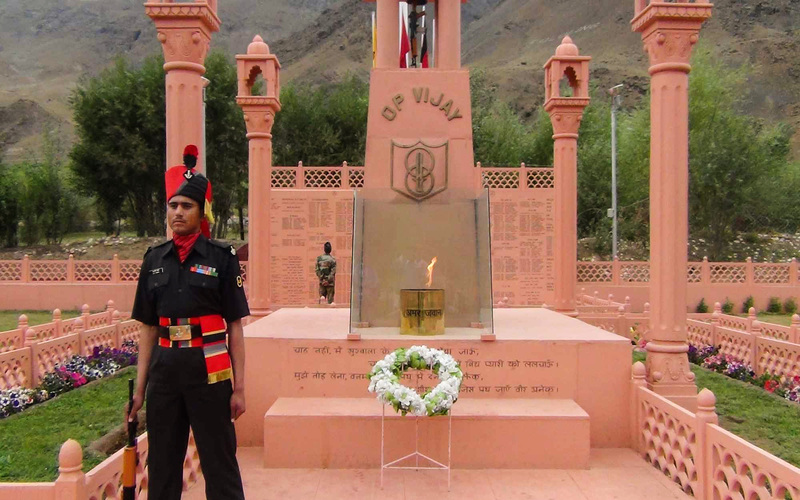 Thank you for sharing the Kargil War Memorial photo’s and the question/answer section. The soldiers are to be commended with all respect for protecting India and it’s people. This place is so full of history and you convey it so well. Must have been a very special and touching experience. The area looks gorgeous and peaceful also! What a well written and intriguing article! I admittedly don’t know much about this history so appreciate the information provided in this post. Wow. What an absolutely moving experience. It seems even more moving having visited with a soldier. I love the beauty of the memorial that houses the eternal flame and the dedication you can see the soldier standing there has. Aside from fantastic photos, it was interesting reading. It is a piece of Indian history that I am not very familiar with, so every bit of information was appreciated. Just imagining serving in this remote region makes me shiver. Spending even a day stationed on one of those peaks must be a lifetime experience. This is such an interesting place. It is very photogenic and your pictures are really nie. Plus it has a lot of history. A place worth visiting indeed. This was such a thoughtful article! Loved reading it. I’m sure the experience of actually being there was overwhelming for you.. Your story and pictures made me visualize what it must have been like during the war. Yet, it looks so peaceful now in its beautiful setting. I knew about this conflict, but not in so much detail. The memorial reminds me a bit of our trip to Normandy to see all the D-Day landing sites and memorials. These kind of historical sites are always on our itinerary, so I’ll keep this in mind for our anticipated trip to India. I’ve never heard of this place but now I’d like to visit. The history sounds interesting. Also, great photos! I like visiting sites such as these when I’m in a new region. This sounds like a pretty sobering and moving day of exploring. We have never been into the far northern heights of India but the more I hear the more I want to go. The soldier’s obvious passion for his country is rather amazing as well. I’ve never heard of this 60 day conflict but have often heard of the ongoing niggle between India and Pakistan. We spent a few weeks in Rajasthan years ago and when we were quite close to the Pakistani border heard plenty about the years of tension. Great article! What a touching story! I actually teared up a little bit. I love the images you have shared. This sounds like it was a truly remarkable journey. Such an interesting interview with the soldier. Veer Bhumi with the memorial stones is quite the site. Thank you for sharing your journey. Great job documenting your trip! I never knew about Kargil, so it was great to read. Thanks for the Kargil tour. Never knew so many things. Stunning pictures! I had never heard of this memorial so thanks a lot for sharing this. Really lovely story and the landscape looks beautiful too! In the normal pace of life, we tend to take freedom and peace for granted, specially the generation that has never lived through wars or political turmoil. It is experiences like the one you mention here which make us realise how blessed our life is. Great job at capturing the solemn feeling at Kargil War memorial. It sounds like it’s a place that has captured an event in time – even though a sad one – and you paid great respect to its story and surroundings. 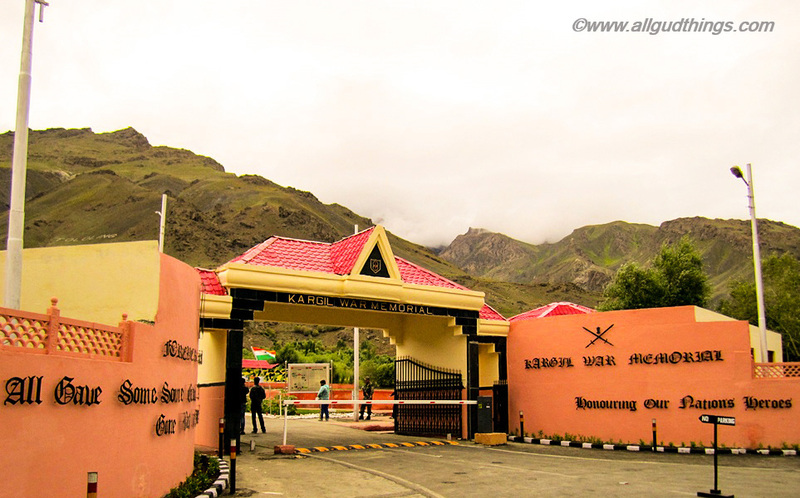 Kargil war memorial definitely evokes feeling of pride and nationalism. It is only when you walk in such memorial that you realise how these brave soldiers gave up their life for our safety. Living in the west, I had no knowledge of this war at all. Because of your post, I googled and bit to learn even more than what you have here. You’ve made this an educational afternoon for me! Thank you for sharing this, it is a touching memorial, and I’m glad to know more about it now. It’s essential to have an insider’s story when writing this type of article. Enemy guards calling each other “brother” when on the same time politicians cannot sit on the same table and resolve the problem. Typical. What a moving post. I think that it’s important for travelers to have some variety in the places we visit. It is very important to visit places that are so humbling like this one. Your interview was enlightening and I’m glad you had a memorable visit! Such a great place to visit. Is one day enough for exploring this memorial? Fantastic post! I love the contrast between this part of India and the busier more touristy places. This is certainly a place to visit if in this part of the country. What a wonderful tribute to those soldiers who lost their lives.So lucky you had someone who could translate the poem on the plinth. How cool that you can see Pakistan from the memorial. Very informative post. I haven’t visited this part of the world yet and I had no knowledge of the Kargil War till reading your post. War is such a horrible thing. These soldiers definitely deserve to be honored for sacrificing their lives, but I don’t think that memorial is any consolation for their families. It really doesn’t matter what country you come from you have to admire and salute the bravery and courage of the men and women that chose to defend our countries. Growing up with an Indian background I know the general background of the wars between India and Pakistan but not in detail – And being English it’s not something we were really taught but I’m sure for you this must have been such a touching visit and to be able to speak to solders and see the memorials must have given such a patriotic feeling. How very interesting. I think we sometimes forget the people who really keep us safe in our countries. When we see places like this, where the other side is so close, it makes us really think about what has been sacrificed in our behalf. Fighting wars in mountainous areas are extremely harsh. We discovered this when we visited war memorials in the Italian Alps. I can just imagine what it must have been like for the Indian and Pakistani soldiers at Drass and Kargil. But isn’t it ironic how peaceful and beautiful war memorials usually are? Interesting bit of history of Kargil War Memorial. Nice setting against a backdrop of hills and mountains which provide meaning and significance of this war memorial. It is great to visit this kind of place to acknowledge and honour the sacrifices that the soldiers did for the country. A difficult time in history for India and Pakistan. This memorial is very touching whether you are Indian or not, and during my first trip to India last year, I got to understand and appreciate more of what happened, and what a beautiful backdrop and scenic part of India. Thanks for this informative and reflective post.